Blog » What Do You Treasure? Six years ago, a huge wildfire was spreading all over our neighborhood. My sister and I were sitting on our driveway, literally watching the fire slowly climb down the hillside at the end of our street. We knew that the call could come at any moment, telling us it was time to evacuate. There is nothing in the world quite like that to make you take inventory of what matters most to you. I remember standing in my living room and asking myself, "If this all burns to the ground tomorrow, what must I take with me tonight?" I had limited space in my car to fit the possessions I valued most in the world. I have a collection of beautiful dolls. As heartbreaking as it would be to lose them, they were not top priority and could stay. I have a massive library of books. Those could all be replaced. Clothes? Furniture? Kitchenware? Again, all replaceable. What was the first thing I grabbed? Family photo albums, wall portraits, many of which were filled with precious images that pre-date digital cameras. I filled my car with as many as I could fit, and still leave room for a few necessities like clothes and shoes. We got evactuated that next morning, and we were very fortunate that our home was spared. Many others were not so lucky. But my perspective was forever changed by that moment of having to evaluate my surroundings and quickly determine what was worth saving, and what was not. Some people might argue that, with the invention of digital imagery, photographic nostaligia is irrelevant. Why would you take them with you when you have a copy of that image on your hard drive, or in the cloud? Hard drives can crash, cloud drives can get hacked, and you can still lose everything you had stored there, just the same as if your home burned down. Yes, you can back up your images in multiple places, which is always a good idea. But how often do you actually look at them, really? I have hundreds of albums on photo websites that I haven't looked at in years. Years. They might as well not exist because I'm so disconnected from them. 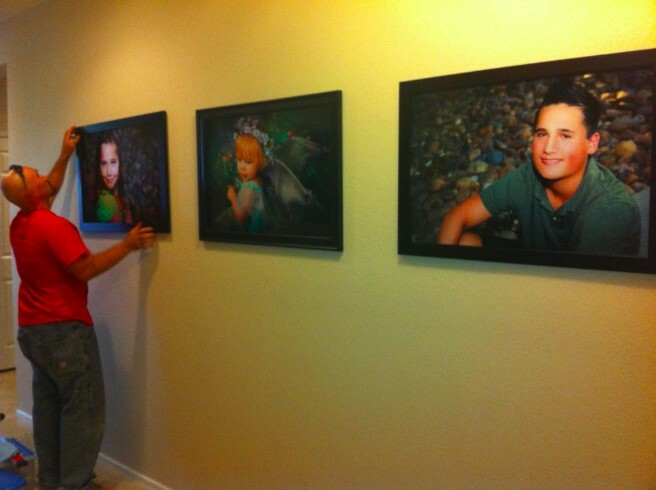 But the gorgeous portraits of our children on our walls? I see those every day. I see them life-size, because I'm a "go big or go home" kind of girl, so they're printed at 20" x 30" size and hung prominently in our entryway. Their portraits are framed and printed on beautiful metallic paper that makes their skin tones just glow and their eyes twinkle. I don't cover every wall in our home with generic artwork; I reserve the places of honor for what we love most in this world: our children, our family. I cherish those images because they captured that moment in time and by printing it large and on excellent quality photo paper, we have that portrait to treasure forever. And I tried an idea that would make the portraits even more personal to each child: I had them each write down their favorite memories from that year, and using Photoshop, I overlaid those memories around the edges of their portrait at a very low-opacity. You have to get up very close to see the writing, but it's there if you know to look for it, and it's there forever. So not only do we have the gorgeous image of each kid, we have the memories they loved the most from that year of their life woven right into them. That's what I value most. The people I love and the memories I share with them. In fact, to say I "value" that is a grave understatement. I treasure it.